There are times when a conventional drill just won’t get the job done. 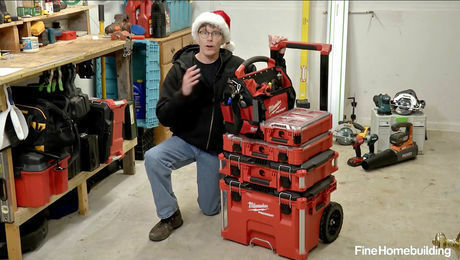 For example, when you’re installing a deck ledger against a concrete foundation and need to drill lots of holes, you need a more specialized tool. That’s when you might pick up a hammer drill or a rotary hammer. While the names are often used interchangeably, they are not the same tools. As the name implies, this tool delivers a hammering action as it drills. This action is created by two internal metal disks with ridges. As the disks spin against each other, the ridges ride up and down and cause the chuck to move in and out. 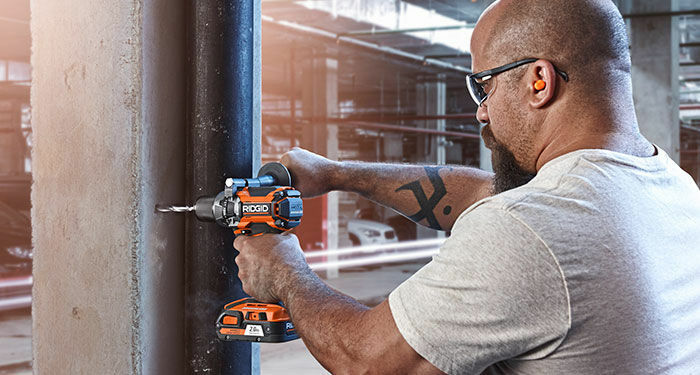 Hammer drills can have the hammering action turned off; with the flip of a switch and the swap of a bit, you can go from drilling in concrete block to boring into wood framing. Typically, these tools can use up to a 1/4-in.-dia. bit when working on poured concrete. A 3/8-in.-dia. or smaller bit can be used in block and masonry. Because of the mechanics needed to create the hammering action, a hammer drill is typically more bulky than a traditional drill. That said, many of today’s hammer drills aren’t shaped and sized all that differently from traditional drills. 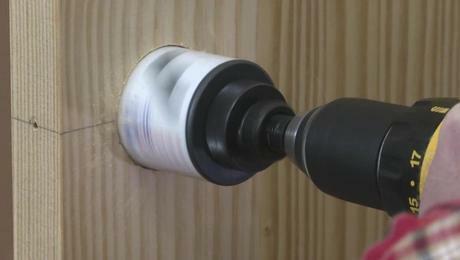 A standoff handle to keep the tool steady is one telltale feature of a hammer drill. 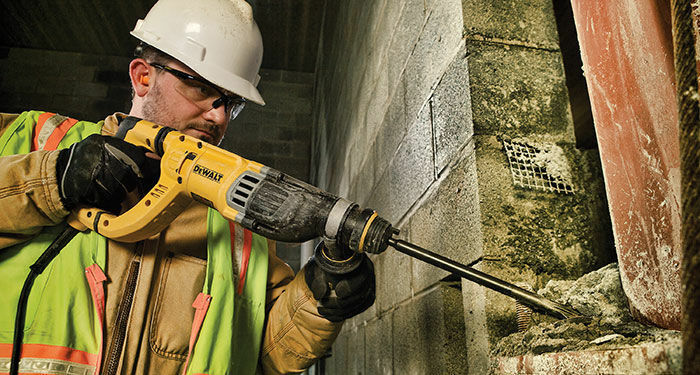 For larger holes, a rotary hammer is the go-to tool. A rotary hammer uses a piston to compress air that moves a striker to create the hammering action. The rate of the blows is slower than with a hammer drill, but those impacts are far more powerful. 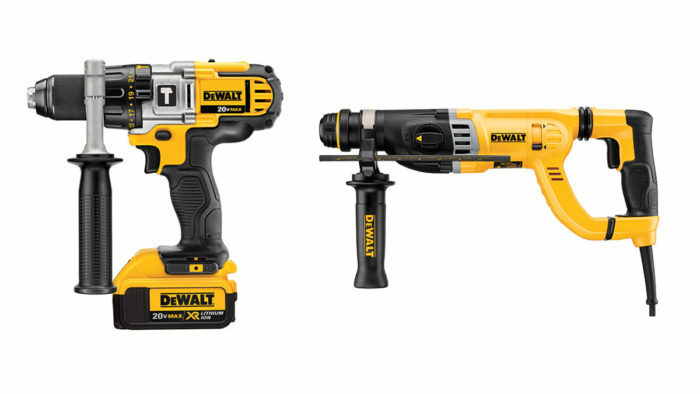 Think of the hammer drill as delivering numerous jabs and the rotary hammer as hauling off with haymakers. The power of the rotary hammer means less work for the user, but it also means that the rotary hammer is not suitable for use on wood or metal. While hammer drills typically are outfitted with a standard adjustable chuck, rotary hammers have a spring-loaded chuck that corresponds directly to the size of the bits being used. This means that you must use only bits that fit that specific chuck. SDS-plus are the most popular bits and are designed for drilling holes with diameters from 5/32 in. to 3/4 in. SDS-max bits step the capability up to a range of 3/8 in. to 2 in. Since the hammering force isn’t created by a spinning mechanism, as it is with hammer drills, rotary hammers can be switched to hammer-only mode. This is useful for light demolition work such as tile removal. Rotary hammers are generally bigger, weigh more, take on bigger tasks, and require less work from the user. They do, however, cost more, so if the job doesn’t call for it, purchasing a rotary hammer might be overkill and wasted dollars. Very helpful since I am having no progress drilling concrete with a rotary drill. 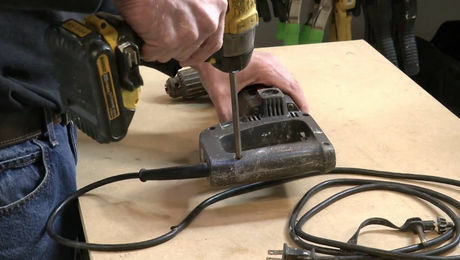 Here's how to breathe new life into a drill with a frayed cord. 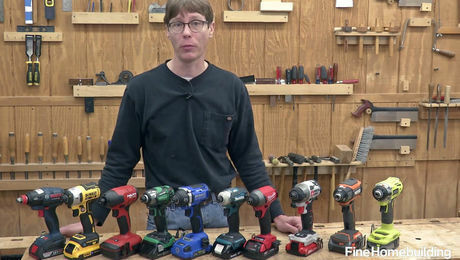 Ten brushless impact drivers put through their paces. Modern impact drivers have longer run times, smaller housings, and better features than your old driver. These hex-shank bits drill all sort of materials, from aluminum to masonry.